Pam Bray Designs: A Girl with Flair: All Things Alter Fall/Halloween Winner!!!!! 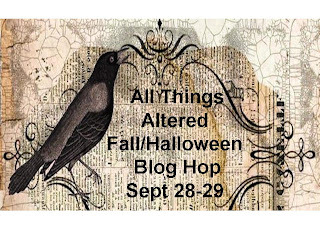 Thank you all for coming and enjoying the All Things Altered Fall/Halloween Blog Hop that was held this weekend. I promised that I would announce the winner today but I had to first let my random little drawer get home from first grade. So as soon as Annie put her book pack down she made her drawing, she was so excited to get to it. SO SHE MADE HER PICK!!!! Oh my Freaking Goodness! This is my first altered object hop you've organized and I am in awe -- and thrilled! One of my regular subscriptions is on the hop, so I've been treated to so much eye candy! I've subscribed and commented and been just thrilled! Thank you so much for starting this, gathering such a wonderful group of paper crafters together, and giving us this opportunity! I LOVE your birdhouse! Just a little creepy and little cute -- perfect for me! I've been thinking of doing a bird house series of my own -- I'm not kidding! I've been getting into construction and altered items lately and so I really am as excited about this as I seem!